My parents visited me last month around Thanksgiving and brought with them a massive 5 pound bag of pecans. It actually says “MAMMOTH” pecan halves on the bag. tehe! I am proud to say that I have already made it through half of the bag, thanks to these cookies and a massive box of chocolate that Tina gave me in her “I’m moving away! Here take everything!” party. tehe! That box is almost gone as well. If you are looking for an ultimate chewy, holy moly, I love pecans and chocolate cookie, this is the one! 😀 Taste tested approved! It’s crazy easy because those are the types of recipes I, uh hum, you can do at 10pm at night on any random day of the week. Start by melting the butter, I actually do it in a large bowl, and then add all the other ingredients. Both sugars, whisk well! Then the egg! Then the dry on top- flour, vanilla, salt, baking powder. and stir! Then lots of chocolate and pecans and you’re set. Well almost. You’ll notice the dough is just a bit soft for what you’re used too for cookies. Stick it in the freezer for 10 minutes or the fridge for a bit longer and the texture will change to easily scoop-able, “I’m ready to bake!” cookie dough! Make golf-ball sized balls of dough and place about 3 inches apart on a parchment lined cookie sheet. Bake until you smell them! They will be golden brown on top and just a smidge cracked. One of my first baking tips on this blog was- Your nose knows! It’s SO true. 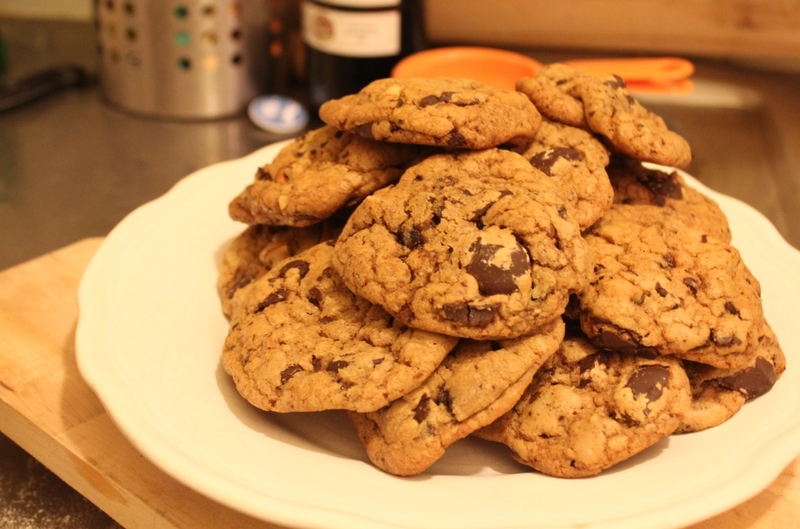 A foolproof way of making cookies, unless you have a cold. 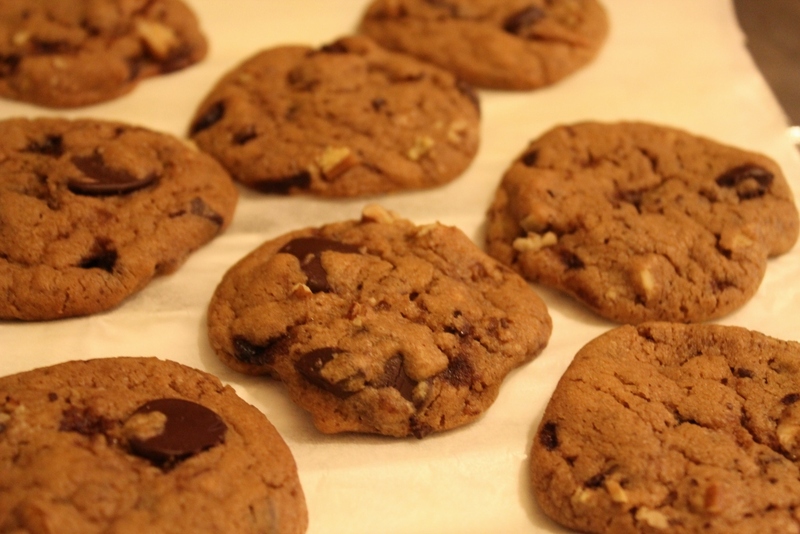 Here’s an awesome video on the science of baking cookies. Melt the butter and then whisk in both sugars while the butter is still hot. Whisk in the egg (the batter will lighten in color and become smooth). If you are adding liquid vanilla, whisk it in now as well. If it is powdered vanilla, add a pinch in with the dry ingredients. Stir in the flour, salt, and baking powder. 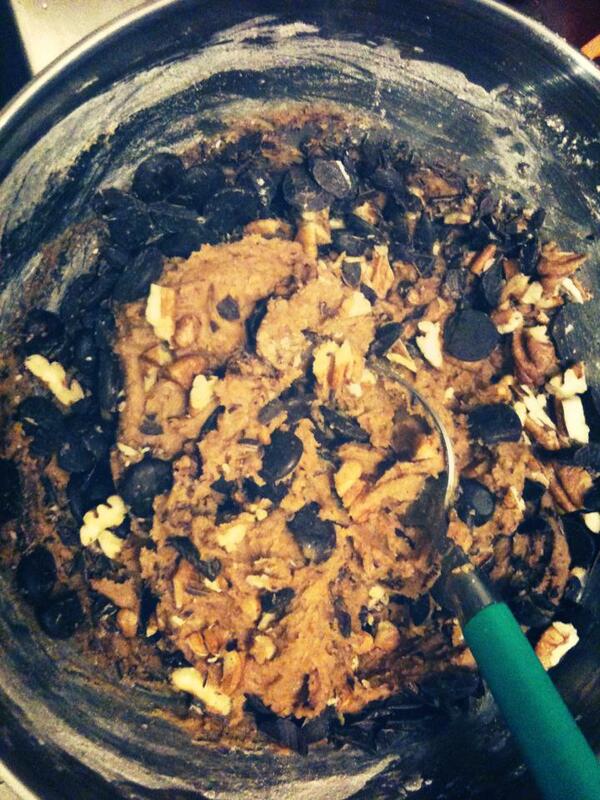 Then the chocolate chips and pecans. Chill in the freezer for 10 mins or the fridge for 20. Form into golf ball sized balls, and place on a parchment lined baking sheet. Bake at 325 degrees F or 160C for 9-10 minutes or until you start to smell the cookies and they are golden brown on top and slightly cracked. YUM! Oh pecans – what I wouldn’t give for some chocolate chip pecan pie. Question though – where do you find brown sugar?? I’ve only been able to special order it online from an American store. Hey!! OMG Chocolate chip pecan pie!? yum!! I totally almost made one for Thanksgiving this year. So! It’s not called brown sugar but…. muscovado! It’s a super close equivalent to dark brown sugar. Absolutely delicious!! I buy mine at G.Detou in the Les Halles area for about 6-8 euros for a large bag. I haven’t seen it at any normal grocery stores like Monop’ but I bet a specialty ingredients shop for patisserie would have it!